This was REALLY good. I absolutely love cream cheese! if I could live off of it, I would absolutely do that. My daughters, Phoebe and Carla both loved it. 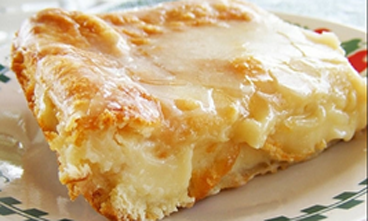 The Easy Breakfast Cheese Danish was just the right amount of sweet and tart all put in one pan. The crescent rolls I had to stretch out to make them fit into the 13x9 pan. For the glaze I just mixed the ingredients together and used a whisk. The glaze was still too liquid by the time that it finished baking and cooling off. I also cooked the recipe for 45 minutes and the top came out a dark brown and a little bit crispy. Depending on your oven, I would only recommend cooking the pastry for 35 to 40 minutes and keep an eye on it. I hope you all enjoy! !